We are committed to helping make your special day as delicious as possible! Every wedding is a unique event, and we treat it as such, working with you to create the perfect flavor combination putting together the perfect design for the wedding cake, and matching the display to your wedding style and theme. Whether your wedding will be highly formal with sweeps of satin and tiers of lace or a relaxed, funky barbecue with a tropical theme, we at Prohibition Pastries can help make the cake the highlight of the celebratory feast. From a tower of gleaming white fondant covered with a glorious cascade of sugar roses, to a do-it-yourself “Cake Cocktail” buffet, we can customize a cake that will fit your theme and is guaranteed to taste amazing! The following base prices will be used as a reference when planning wedding cakes. Large Handcrafted sugar flowers: priced per flower. Bell Jar Cakes are rustic and whimsical, they look stunning and colorful with the layers of cake, filling and frosting all visible though the glass of the jar. They are perfect for outdoor weddings as they are covered, so no wind will blow dirt onto the cake and bees will not be attracted to the sweet scent of cake! Jars can be personalized and/or decorated to fit your special occasion, and bonus – you get to keep the jars as keepsakes for you and your guests! Set up your appointment for your no-obligation tasting for your special day! Still want more information? Check out our frequently asked questions below! How far ahead do I need to book my wedding? We are a small bakery and we put a strong focus on quality and detail for our orders. Therefore we only accept 12 weddings a month. We book on a first come, first serve basis and in our experience dates start to fill up around 6-8 months prior to the wedding date. Can you accommodate food allergies and/or food preferences such as vegan or Gluten Free? Yes, to a degree. We are not a designated gluten free, vegan or nut free facility, however, we can be sensitive to your preferences while working on your cake. We have made wedding cakes with those specifications in mind before without any problems, but we do still recommend that you tell your guests that the cake, while made with those sensitivities in mind, was still made in a facility that processes dairy, eggs, wheat and nuts on a regular basis. We will not use any sugar substitutes in our baking. Can I customize the flavor of my cake? Yes! If you have a specific idea for the flavor of your cake we can work with you to put together the optimal pairing of cake, filling and frosting. However, we do ask that you make your preferences known to us before your cake tasting so that we can be sure to have your desired flavors on hand for your tasting pleasure! How do we set up a cake tasting, and what does it entail? 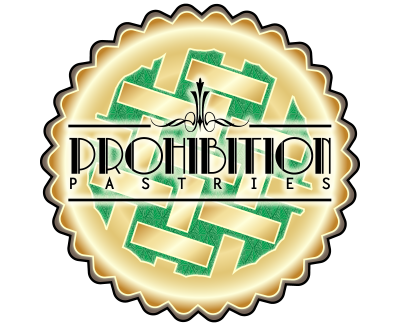 You can give us a call at 412-886-4533 to schedule a tasting or email us at weddings@prohibitionpastries.com. At a cake tasting you will sit down with a cake consultant to discuss your wedding details and try some cake flavors! Please bring with you pictures of cake designs that you like as well as any items that you would like us to link to the creation of your cake such as color swatches, patterns and personal pictures or stories. We ask that you please bring no more than 4 people to your tasting. You are allowed to pick up to 6 flavors of cake to taste. So, you are a boozy bakery, does that mean we can get an alcoholic cake? We give you both options. On a day-today basis at our bakery the process that we use to infuse the alcohol into our baked goods results in the actual alcohol content baking out of the final product. However, we can do what we call a “soaked cake” where we insert into the cake a layer of genoise cake that is liberally soaked with the alcoholic infusion of your choice (cocktail flavors available) to give you that full boozy bakery flavor. We just ask that you be mindful of your guest list and perhaps have a small side option that is non-alcoholic for the children and non-drinkers among them. I don’t want a traditional wedding cake, what are my options? We encourage you to think outside of the box! We have made pie buffets, individual pies, cupcakes, cream-puffs. You name it! Call or email us to discuss your fun idea for your wedding day dessert. Your flavors are all so delicious – we can’t choose! What can we do? If you are struggling with picking a flavor, not to worry. We can make each tier of your cake a different flavor! You might also consider cupcakes for your wedding – they allow for a larger variety of flavors at your reception. Yes. Whether it be that you are going for an non-cake dessert option, or just that you are not dessert people but still want that iconic moment of cutting the cake together, we can make you a small single or double tiered cake to use for that perfect photo opportunity. What if we want you to make the cutting cake and we, a friend, or our caterer makes the supplemental cake for the guests? Unfortunately it is against our policy to serve our cakes at an event where other cakes will be served. It is a liability issue. I don’t know the sanitary conditions in which the other cakes are made. If food poisoning should occur, I don’t want to be associated with that. This is also to protect our reputation. We’ve worked hard to have a reputation of having wonderfully flavored cakes, made from the finest ingredients that are beautifully decorated. I do not know the quality of the other cakes there and cannot risk being mistaken as the creator of those cakes. We want to save the top tier of our cake for our 1 year anniversary, is that possible? We do not recommend the flavor and quality of a cake that has been frozen for a year. Therefore it is our policy to offer you a small cake in your wedding flavors to be picked up on your one year anniversary -freshly baked – and decorated with your wedding cake design. We will even send you a reminder email a week before so you don’t forget about your cake! However, if you really have your heart set on saving your top tier, yes, we can provide a box for it, we will make sure it is left with the cake when we deliver with instructions for your caterer to save the top tier. Do you make grooms cakes? Yes. Let us know what you ideas are and we can work with you to create a suitably fun and flavorful grooms cake! No. We take a lot of pride in the quality and flavor of our cakes. Therefore it is our policy to bake everything fresh for your occasion. Can I do a small tiered wedding cake and supplement with sheet cakes? How much cake will we need to feed our guests? We suggest that you opt for a slice of cake per person. Some guests might not eat cake, others will want more than one slice. For cupcakes, we suggest you opt for anywhere between 1 and 1.5 cupcakes per person. Most caterers will use the wilton cutting guide for wedding cakes, and so we too, use that when we are planning the size needed for your wedding cake. I’m having and outside Summer wedding, can my cake be outside, or will it melt? We recommend that cakes stay within the temperature range of up to 75 degrees Fahrenheit. Outside of that range the frosting’s integrity, and therefore the appearance of your cake, can be affected. If you have an indoor space available we suggest you keep your cake there until absolutely necessary. Will you put fresh flowers on our cake? We do not put fresh flowers on your cake, but we can supply everything but the flowers and your florist can adorn your cake on site the day of. If you are looking at using fresh flowers for your cake please consult your florist first for a list of flowers that will not be toxic and therefore dangerous if consumed to your and your guests. If there is a certain flower that you want on your cake consider using sugar flowers as an alternative, they are non-toxic and will not wilt or brown on your cake. Do you supply cake toppers that we can use? Yes, we have a book of options we can show you at your cake tasting. You can purchase this outright or rent it from our facility. If we do not have a topper that fits your style it will be your responsibility to find on that does and make sure that it is on site when we deliver and set up the cake on your special day. Can you use a cake stand of ours instead of one of your rentals? We will not set the cake on a stand that is not ours should the unfortunate situation arise of it failing. If you choose to use your own stand we will deliver your cake and put it on the cake table, but getting it onto the stand will be your responsibility. Once the cake is successfully delivered we will no longer be responsible for the safety of the cake. Yes. For best results we will need physical color swatches. For every color there is a $20 color matching fee. How do we pay for our cake? Wedding cakes require a 50% deposit upfront to secure your date. This deposit is non-negotiable and non-refundable. The remaining balance will be due 15 days prior to your wedding date. If there are changes to your wedding cake design, or the amount of cake needed etc., those changes will be reflected in the remaining balance. We can accept payments via credit/debit card, check or cash. If you pay with a personal check and it is returned by your bank we will charge you an additional $30 and require a money order, cash or credit payment within the next 3 business days or your order will be considered null and void. Please be aware that there is tax on service, charges for delivery, set up and retrieval, we have stands available to rent but a security deposit will be required on all equipment leaving our place of business.